Entertain a whole herd of dino fans with this adorable Stegosaurus Dinosaur Pinata. Shaped just like kids’ favorite spikey-backed dinosaur, this pinata will make a dino-mite addition to any little boy’s dinosaur birthday party. To get the prehistoric party fun started, just hang this pinata from the ceiling, or from a sturdy tree branch outside. Then, have Jurassic explorers line up and take turns trying to break it open with a stick or a pinata bat. Make sure everyone has bags ready to collect the goodies inside when it finally gets smashed apart (pinata filler not included). 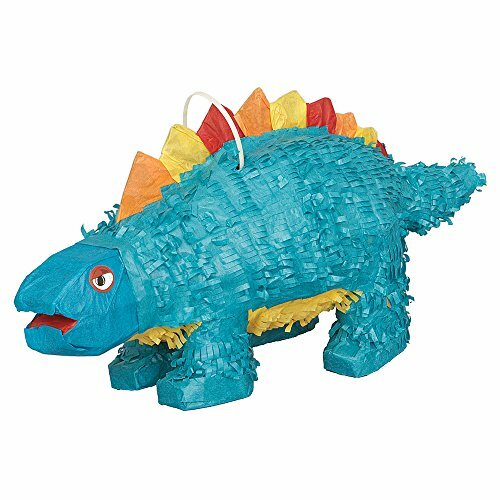 With enough room inside to fill with up to 2 pounds of candy and other dino-rific party favors, this pinata is sure to get the crowd roaring at any prehistoric bash in no time.